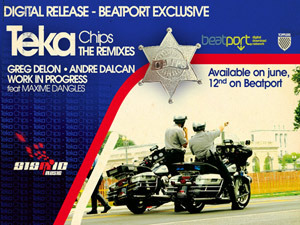 Let's do it again with TEKA - CHIPS EP - The Remixes - Available on June 12, with remixes from André Dalcan, Greg Delon and Work In Progress (Maxime Danglesc & Koni). Digital distribution for this remix pack only on Beatport June 12. C'est repartit avec TEKA - CHIPS EP - Les Remixes - Sortie le 12 juin avec des remixes d'André Dalcan, Greg Delon et Work In Progress (Maxime Dangles & Koni). Sortie digitale uniquement pour ce part 2, exclusivement disponible sur Beatport le 12 juin. This release is definitely playable but not mind-blowing. Dalcan's mix was very Bangin' Ed Banger-y. Delon sort of went the Luca Bacchetti tribal minimal style and it worked well without pushing many boundaries. I really liked the Work In Progress mix as it had the 'freshest' <-- (stupid word) sound, meaning I hadn't heard that style being made much these days. Would definitely find a place for all of them in various sets.